The debate, moderated by Mónica López, Head of the Meteorological Service of Spanish public TV TVE, started with a welcome address by Antoni Ballabriga, Global Director of Responsible Business at BBVA, and was later on introduced by EU-ASE President Monica Frassoni and José López-Tafall, GECV Secretary General. López-Tafall stated that “it is possible to decarbonise and grow at the same time, it is economically viable”, while Frassoni underlined that we should bet on decarbonising the economy and reminded the audience of the urgency of a clear, ambitious and just roadmap. José Manuel González-Páramo, Head of Global Economics, Regulation and Public Affairs at BBVA, who also took part in the debate, reminded the attendants that, according to the European Commission, we still lack €180,000 in additional annual investment if we want to reach the energy and climate objectives set for 2030. 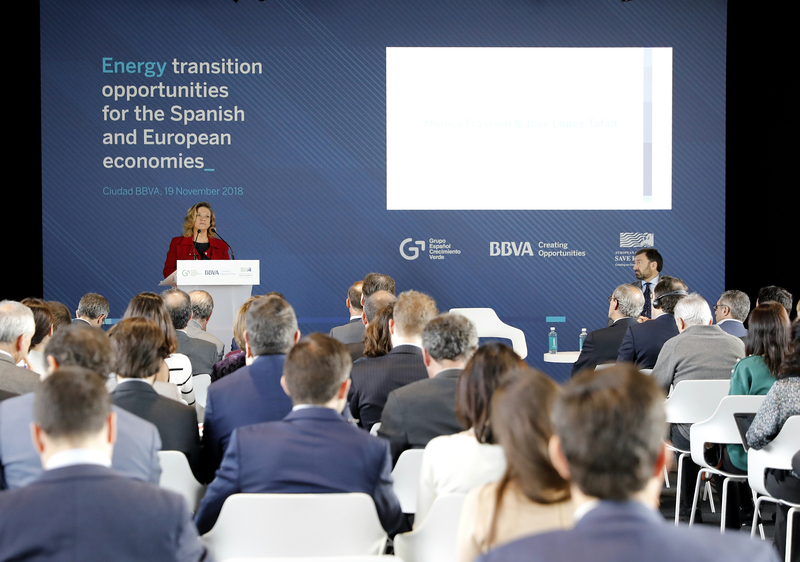 He also highlighted BBVA’s commitment with climate change and the key role businesses play. Hugo Morán, Spanish Secretary for Environment, highlighted the great work EU-ASE and GECV are doing by organising this type of initiatives and pointed out that “mitigation is not synonym to deindustrialistion and adaptation doesn’t mean resignation”. He also underlined the importance of the future Climate and Energy legislation, that will guarantee that Spain complies with the goals set by the European Union and the Paris Agreement. Morán argued that “the setting of a stable regulatory framework, with adequate incentives and that fosters the necessary investments taking into account the market reality, is key to achieve a successful transition“. Director General for Energy at the European Commission, Dominique Ristori, started his intervention stating that the new regulatory framework for energy and climate proposed by the Spanish Government is an opportunity for all, both businesses and investors. Ristori said that it is necessary to show clear leadership at the national level to address the energy transition, that has become a priority. Such leadership, he told the audience, should be based on three pillars – a clear and predictable regulatory framework, business opportunity, and access to sustainable financing. He also underlined that organising this type of initiatives is both important and timely, as they seek to create positive synergies between national and European authorities and what he defined as new business. The session concluded with a round-table debate between representatives from different business sectors, NGOs and Public Administration, with speakers from EU-ASE members Danfoss and Knauf Insulation, as well as from Iberdrola, WWF Spain, the Institute for the Diversification and Saving of Energy (IDAE), and the Spanish Office for Cliamte Change (OECC). Ernesto Ubieto, President of Southern Europe Region at Danfoss, underlined the important role governments have to play for placing energy efficiency at the centre of the implementation and transposition of the European clean energy legislation and, especially, with regards to the EED and EPBD. 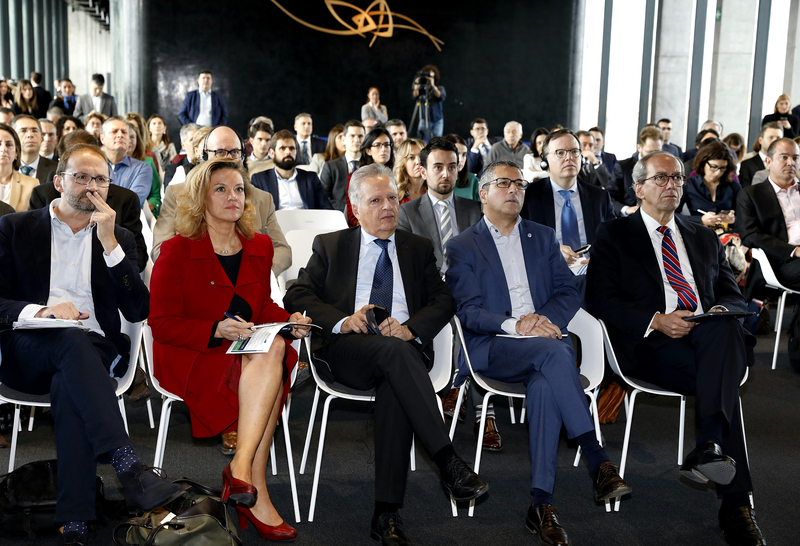 Óscar del Río, General Manager at Knauf Insulation Iberia, stated that “without the Public Administration we cannot advance in tackling the challenges we face. “Businesses are ready to play their part; public administration needs to lean on us more”, he said. Joan Herrera, Director of IDAE, claimed that “we cannot allow ourselves [Spain] to be rich in resources and poor in political drive and ambition. We need regulation”, while Valvanera Ulargui, Director of the OECC, stated that “once we are all aware of climate change and the energy transition, the moment has come to take action and generate actual facts and data”. Ulargui pointed out that this is the message they would take to the upcoming COP24, “with a message of ambition and, especially, urgency”, she said. Both the Grupo Español para el Crecimiento Verde and the European Alliance to Save Energy (EU-ASE) consider the debate, celebrated in the prelude of the presentation of the Climate Change Law draft, was crucial to convey the message to the Spanish Government that a big part of the Spanish business sector clearly supports the energy transition and the implementation of a national and European regulatory framework that is strong and leverages the necessary investments for achieving the change of economic model and of paradigm.